Are you an International company keen on entering the fast growing Indian solar sector? 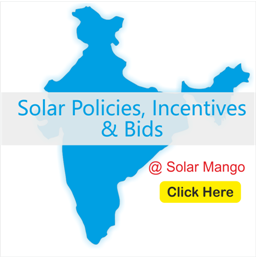 Solar Mango provided turnkey market entry and market development assistance for a major German firm in the solar plant monitoring space to enter, recruit, conduct road shows, and acquire prominent customers for the Indian market. Solar Mango assisted the World Bank in getting a thorough understanding of solar and other renewable energy investments in India. Solar Mango coordinated some of the most prestigious and largest business networking events for renewable energy in India, including RENERGY organized by the government of Tamil Nadu. These events get together some of the most high profile companies and renewable energy experts in the country. With our presence in the Indian solar sector right from its inception six years back, we understand the Indian market and regulatory structure exceptionally well and hence are able to provide clear, comparative studies of the solar market and regulations with region-specific analysis. One of our core specialties is studying the Indian solar market for key trends and attractive business opportunities. In this context, our research and assessment covers niche and emerging opportunities, identifying key market drivers, and risk/return evaluation. This expertise will be invaluable to an international firm that is new to the Indian market and needs to understand the market potential thoroughly before deciding on significant investments in the country. While solar is a relatively nascent industry in India, it is already highly competitive. 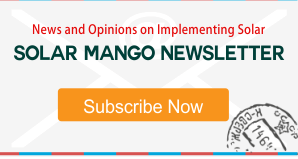 One of Solar Mango’s core strengths is its understanding of all segments of the Indian solar PV sector, the key players in each sector, and their strengths and weaknesses. We analyse incumbent competitors within the industry to provide a comprehensive view of the competitive landscape, something critical for a new entrant to the Indian market. We assist our clients in developing high-impact marketing and sales strategies. In addition to the consulting aspect, we also assist in developing ground-level go-to-market strategies that could include becoming an extended part of the client’s marketing team. For a company that is just entering India, such ground-level assistance could mean significant acceleration to market, and thus your company could “hit the ground running”. Solar Mango has one of the most comprehensive networks of professional and industry contacts in the Indian solar energy sector. Our extensive network and well-honed due diligence services help our international clients identify the most effective partners for their solar business. For those international firms that wish to take our assistance in setting up shop in India, we help build our clients’ soft infrastructure by identifying the best business locations and human resources. How Can My Small Solar Co Enter the Big Indian Solar Market? This small Germany solar company realized that the Indian market for his solar power plant monitoring system would be growing at a furious pace. But India is a large country, and this small firm did not know where to start. EAI not only provided them with the go-to-market strategy that enabled them to focus on the lowest hanging prospects, the EAI team even assisted the German company in winning their first customer.